My colleague Andrew Towler is starting up a range of new trauma-informed yoga classes. She is a kind and calm teacher with a depth of practice and knowledge. 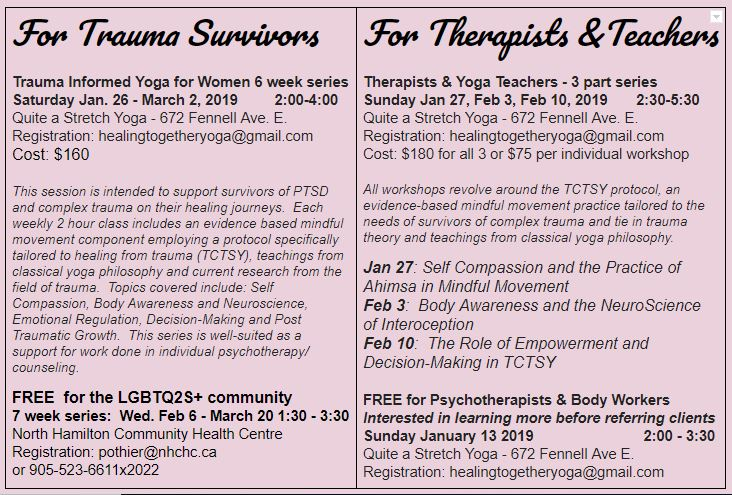 I recommend her classes for those with a history of trauma who are also in therapy. Find out more at Healing Together Yoga. Andrea’s work builds on mindfulness skills such as those I mention in Mindfulness tools for everyday sanity and one of my favourite qi gong movement practices. Approaches that integrate movement and body awareness into healing are so important especially for trauma survivors. In Andrea’s courses you can learn more about how to practice (rather than just think about) self-compassion, something I’m relying on more and more in my work with clients. This entry was posted in Courses, Mindfulness-based psychotherapy. Bookmark the permalink.